According to The Center for Prisoner Health and Human Rights, approximately half of the prison and jail inmates meet the DSM-5 criteria for substance use or dependence, and significant percentages of state and federal prisoners committed the act they are jailed for while under the influence of drugs. In five cities in the United States, 63 to 83 percent of arrestees had substances in their system, with marijuana and cocaine being the most common. When a crime is committed under the influence, an individual goes to jail, gets released and continues using, which results in more jail time. One study found that many prisoners who are released relapse. Participants of this study included 29 men and nine women, between the ages of 22 to 57. Over half of the participants knew someone who had overdosed, three of the participants had overdosed after their release and 16 participants lived in shelters. 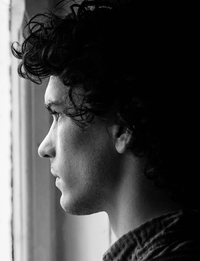 In this study, participants cited poor social support, lack of financial stability, exposure to drugs and social isolation as reasons for their relapse. The courts are looking for a way to address this problem, and they know that jail is not the treatment. Ascension Recovery Services provides another option. Whether or not a run-in with the law offered a wake-up call, legal intervention is often the first step toward recovery. Ascension offers addiction recovery legal services to support families and individuals in need of help when navigating the legal process associated with substance use issues. 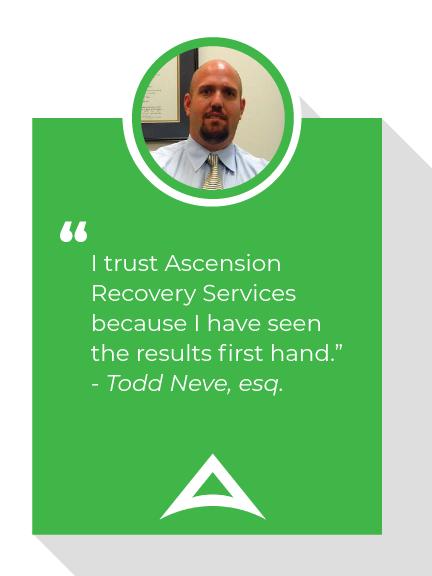 Ascension has earned the respect of the courts because we scrutinize requests for legal services to ensure our clients possess a genuine desire for a healthy recovery. Medical costs related to overdoses, injuries and short-term and long-term illnesses related to drug use. Legal costs related to substance use arrests like court and lawyer fees. Family costs related to supporting the loved one affected by substance use disorder or their children. 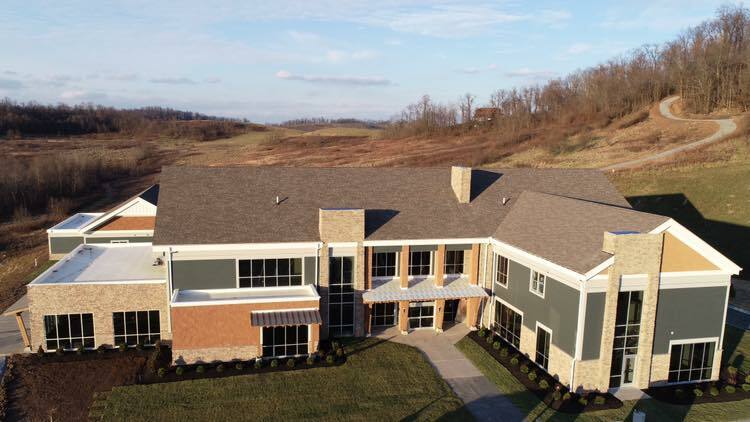 Residential treatment: This is a live-in facility that has a 24-hour staff and typically lasts 28-days or more depending on insurance and the complexity of the SUD with comorbidity. Partial hospitalization: This is typically five days a week, six hours a day treatment provides the necessary level of care needed in an outpatient setting. Intensive outpatient program: This is typically a three hour a day, three days a week treatment. Depending on the client’s needs, typically we recommend residential or partial hospitalization treatment followed by appropriate aftercare, setting the client up for the best chance of long-term success. If the court recommends an extended treatment period, our staff will work with the lawyer, family and client to find the proper treatment plan, and eventually, work to facilitate treatment updates with the lawyer and court. At Ascension, we believe aftercare is just as important as the treatment. If the client was placed in a residential treatment center, partial hospitalization program or intensive outpatient program, after their treatment, we typically recommend that they live in a sober living home. A sober living home will help the client transition into an everyday lifestyle with the support of a group of people who are going through similar events, will hold them accountable for their actions and provide an additional third-party to report on their progress. Sober living in conjunction with continued outpatient treatment provides multiple levels of accountability and is often in the best interest of those we serve. Statistics show the longer an individual receives appropriate treatment often equates with an increased likelihood of sustainable recovery. Our staff receives many questions from family members. Below are the four most common questions we receive. Is the cost of treatment covered under the cost of your services? The cost of treatment is not covered under our services. However, our staff will do everything in their power to keep the cost to clients as low as possible. We have the ability to do this because of the volume of referrals and relationships we build with treatment providers across the country. Do I have to have a lawyer to engage your legal services? Families who come to us for our legal services do not need to have a lawyer already. Our staff regularly advises families on attorneys that are skilled in substance-related legal matters. Do I need to hire a lawyer if you provide legal services? Your loved one can get a public defender, or you can hire a lawyer with or without our guidance; however, our services are substance use disorder (SUD) related, meaning our main goal is getting your loved one help in the form of treatment instead of incarceration, not just providing legal advice. My loved one is already in jail/prison but needs treatment for their SUD. Can you help them? If your loved one is in jail for substance-related issues, we can help you work to get them out of incarceration and into treatment. 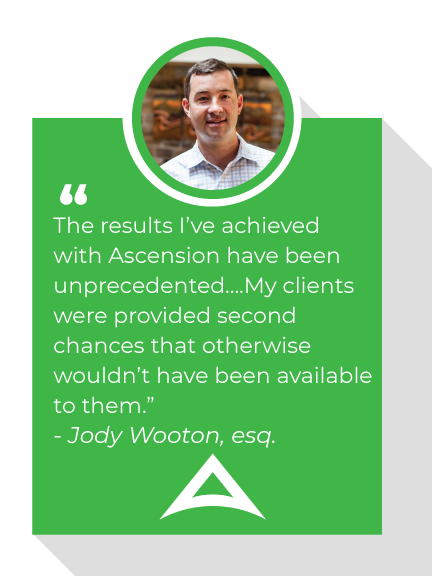 Ascension will help lawyers by taking a great deal of tedious work off their plate. Ascension staff will consult with the client, their lawyer and often family to navigate appropriate substance misuse services. Ascension will consider court restrictions, insurance, client’s needs and financial tolerability when considering placement of the client. 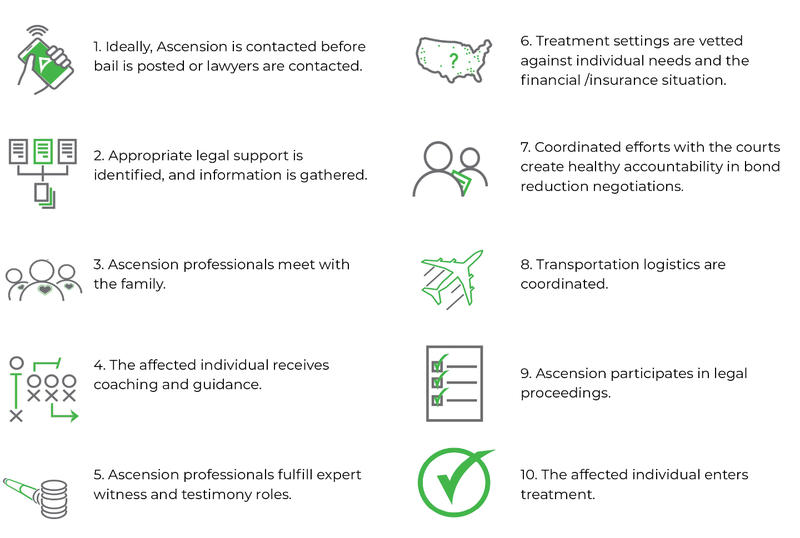 Ascension also serves in a case management role with the client until resolution of the court proceedings such as dealing with issues that come up while their client is in treatment, facilitating communication between attorney and client during the treatment process, provide updates on their progress and help them transition between necessary levels of care. Who covers the fees associated with your legal services? 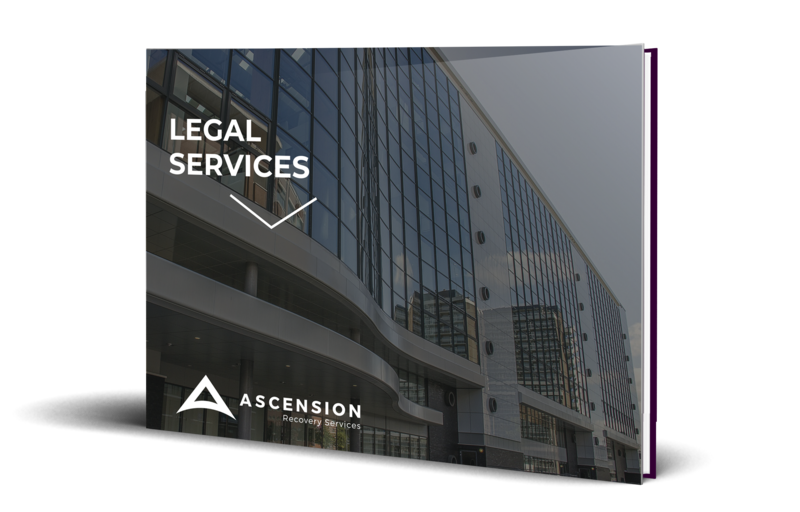 Ascension contracts directly with the client and their family, avoiding any direct costs to the attorney. How quickly can a plan be in place once Ascension services are engaged? Ascension staff regularly facilitates a tailored plan for the client within 48 hours of retaining our services. I already have favorable outcomes for my client’s that struggle with substance-related criminal charges, why should I utilize Ascension’s legal services? 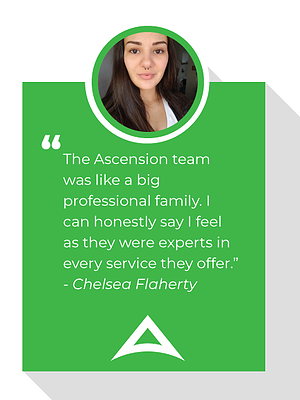 Ascension will add value to the clients that you serve. By allowing Ascension to focus on the substance treatment process, attorneys can shift their focus to the current legal jeopardy at hand. This can relieve the burdensome task of acquiring limited resources outside the scope of your profession and improves the likelihood that your client receives the long-term help they need to reduce recidivism. Binswanger, I. A., Nowels, C., Corsi, K. F., Glanz, J., Long, J., Booth, R. E., & Steiner, J. F. (2012). Return to drug use and overdose after release from prison: a qualitative study of risk and protective factors. Addiction science & clinical practice,7(1), 3. Schwartz, R. P., Gryczynski, J., O'Grady, K. E., Sharfstein, J. M., Warren, G., Olsen, Y., Mitchell, S. G., … Jaffe, J. H. (2013). Opioid agonist treatments and heroin overdose deaths in Baltimore, Maryland, 1995-2009. American journal of public health, 103(5), 917-22.